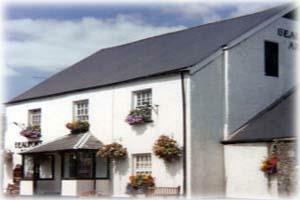 Beaufort Arms01873 832235work InnOur 17th Century Coaching Inn is nestled at the foot of the Black Mountains within walking distance of the medieval market town of Abergavenny and just 7 miles from the UNESCO World Heritage Site of Blaenavon. The Beaufort Arms has a wide appeal to business travellers and tourists alike and is available all year round. Awarded 3 star status by the Welsh Tourist Organisation 'Visit Wales', the Beaufort Arms has everything to rival the bigger more expensive hotels all with the added benefit of the personal touch. Our 17th Century Coaching Inn is nestled at the foot of the Black Mountains within walking distance of the medieval market town of Abergavenny and just 7 miles from the UNESCO World Heritage Site of Blaenavon. The Beaufort Arms has a wide appeal to business travellers and tourists alike and is available all year round. Single Occupancy £40.00 per night. Take the M6/M5 south as far as Junction 8 - then the M50 to Ross on Wye. Follow the route to Monmouth-Newport. 6 miles past Monmouth turn left on to the A40 Abergavenny. Signposted on the turn is Raglan on the left. Drive straight for 1/2 mile into the village. The church is on the left, the Beaufort Arms faces you on the right. Take the M4 over the new Severn bridge to Junction 24 Newport. Turn right onto the A449 towards Monmouth, after 14 miles turn towards Abergavenny A40. Left again signposts Raglan as above.